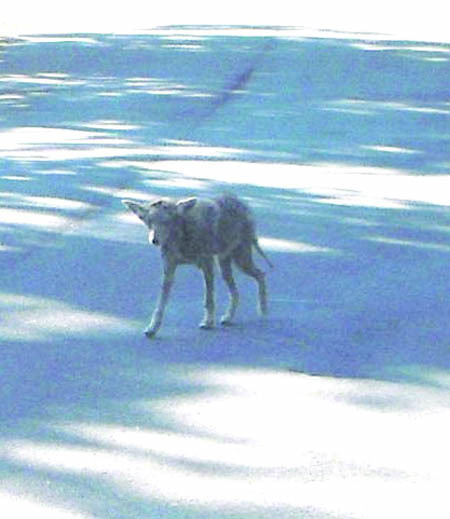 Pacific Grove Police Department’s Animal Control Officer, Elizabeth Conti-Yeo, is among several people who have observed a particular coyote recently. The police department, along with the California Department of Fish and Game, are on the alert and urge citizens to be aware of the danger also. 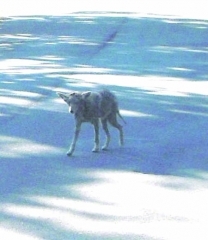 The coyote appears to be in a weakened condition and is perhaps suffering from mange. It has been sighted numerous times in the past week by citizens. The sightings have occurred in the Beach Tract, golf course, Asilomar and Rip Van Winkle Park areas. Chief Darius Engles advises the following: Coyotes can become a threat if they become comfortable around humans, usually as a result of feeding them. You should not feed a coyote as this will tend to habituate it and eventually lead to its demise. If you encounter this coyote, or any other, you are urged you frighten it off by making loud noises and waving your arms. Throw objects near it to move it along. Remove cat and dog food from the area of your residence and make sure garbage cans are secure. If you have pets, keep them indoors or on a leash; do not allow them to roam free. Pick up fallen fruit and cover compost piles. Coyotes are typically nocturnal and prefer to hunt for rodents like mice and rabbits. But they are opportunistic hunters and will kill dogs, cats and other domestic animals.